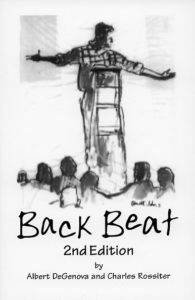 The first edition of Back Beat was published by Norbert Blei’s Cross+Roads Press in 2001. Blei was familiar with the poetry of both DeGenova and Rossiter and had seen them perform together as the duo AvantRetro, a performance poetry presentation using musical accompaniment and other techniques to enhance the poetry readings. Both the poetry and performance of the duo’s poetry clearly gave a nod to the Beat writers. Blei asked both poets to write a memoir combined with their poetry that would illuminate the Beat influence on DeGenova’s and Rossiter’s writing. His purpose: to create a book that clearly traced the Beat aesthetic as it is being expressed 40 years later. Blei’s only caveat to the poets was that they could not compare notes, each section of the book was to be written completely independent of the other. The result is Back Beat. Brought out in a second edition by Wayne Allen Jones’ Fractal Edge Press including new poems and the original Norbert Blei introduction. 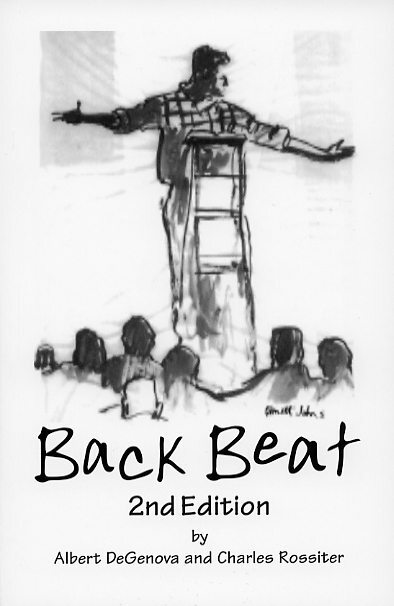 Back Beat 2nd Edition, Co-Authors Albert DeGenova & Charles Rossiter, Fractal Edge Press, Chicago, 2006. Back Beat beats everything for being beater than the Beats. Thanks for Back Beat – I loved it. The poems brim with the blood of a poet. I got your book and it’s wonderful . . . the poems are so powerful and beautiful.
. . . one of the most moving, fascinating, interesting books I’ve read in a long time. Back Beat is a monumental achievement, proof that the beat can survive the millenium. Their raw, pulsating poetry and knife sharp prose shows they are true descendants of Kerouac, Ginsberg, and Ferlinghetti . . . a sweet, choice read. – Mark Scarborough, Review in Free Verse.